*The article below is a shortened version of a conference paper of the same name that I presented at the Popular Culture Association/American Culture Association National Conference held in New Orleans, LA on April 4, 2015. Additionally, the presentation is portion a longer work exploring the role of musicians in the twenty-first century speaking to the idea of the landscape in American culture. In the nineteenth century, Ralph Waldo Emerson reflected on man’s relationship to the natural world as an essential component to human survival and nourishing spirituality. Transcendentalism was a reaction to the rationalism of eighteenth-century Enlightenment, as well as a revisiting of man’s relationship with the sublime in nature. Today we see a return to a connection with the environment as a result of a tremendously technological landscape, and while Americans are not willing to live the naturalist lifestyle of John Muir, sentiments of yearning for nature and the wilderness emerge in twenty-first century cultural production. The music and lyrics of the northeastern American songwriter Matt Pond serves as a case for sentiments of the pastoral and the sublime as he reaches to the language of the natural world to illustrate love and life in the twenty-first century. 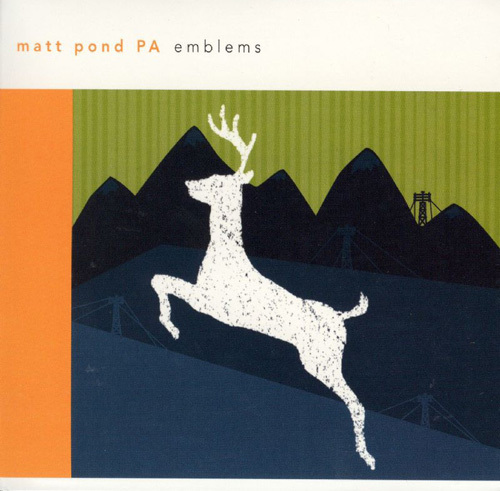 Matt Pond formed Matt Pond PA in Philadelphia and the band released their first album Deer Apartments in 1998. Over the course of sixteen years, Pond released nine full-length albums and nine EPs, with members of the band shifting as the years go on. Simply looking at the album titles, one can see that Pond’s aesthetics are rooted in natural elements: The Nature of Maps (2002), The Dark Leaves (2010), Spring Fools EP (2011) are such examples. The cover art for the album Emblems (2004) contains the silhouette of a deer in mid-leap along a landscape of collaged mountains and rolling hills. Notably, markers of technology are evident in the image. The tops of power lines peek through the slopes. The flatness of the image, due to the stylized deer and landscape, is enhanced by the paper-like texture of each segment. The “sky” is vertically striped green and the land is varying shades of blue – opposite of the natural world. The white figure of the deer in the center of the picture also creates a contrast to nature. Not a shadow, the body serves as a window. Clearly, the tension of nature and technology is evident in the Emblems album art. Though a more conclusive and direct relationship between Pond’s worldview and the natural world is evident in an analysis of his song lyrics. In The Machine in the Garden, Leo Marx describes the contradiction between urban developments and the captivation of the serene, if slightly developed, pastoral landscape of the farmers as the primary moving force of the frontier in the nineteenth century. At the core of his argument is the tension between nature and technology. Marx works his thesis through the myth-symbol method and draws evidence from literature and visual art. In an analysis of Pond’s lyrics, the goal is not to support the myth-symbol process, but to locate in contemporary music a similar sentiment of pastoral fascination. Writing of post-1960s American music, ecomusicologist David Ingram asserts, “The pastoral mode has come to dominate American musical representations not only of the rural, ‘middle’ landscape, but also of wilderness” and “like the pastoral mode, American popular music itself is an urban product.”  As Marx declares that the pastoral obsession existed due to its difference from the urban, so American music can prioritize the pastoral as a difference from the technology – and even location – that produces it. Pond may not use pastoral language necessarily for political purposes, he employs bucolic poetry to manage more difficult emotions. Ingram’s analysis of musical aesthetics established in political or social activism is limited and does not cover the full range of creative possibilities. Pond’s lyrics represent the pastoral as metaphor for interpersonal relationships. Pond describes the natural world as a place of life-giving mystery in the song “Specks” from the album The Dark Leaves. He is in awe of the beauty in nature, and importantly, how it is significantly intertwined with intimate relationships. Pond unites his belief in natural miracles to a belief in personal connections. Here, more than any other song, Pond’s lyrics mirror Emerson’s transcendental ruminations. The nineteenth-century philosopher writes, “The stars awaken a certain reverence, because though always present, they are inaccessible; but all natural objects make a kindred impression, when the mind is open to their influence.” Emerson’s ideas on nature stem from this sentiment: the natural world is visually available but distant, and the only way to fully grasp its power is by surrendering one’s mind to its stimulus. Pond repeats the theme of “energies” throughout his song as a distinctive connecting factor of all elements. The same force evident in the sky and water, and which rush through his body, bind nature and relationships together. It is the aesthetic comfort of nature – in its wild splendor – that grabs Pond’s attention. The “darkness” that pulls him is no match for the gold and silver energies, even if something is distorted by nature itself. That nature can serve as a language for human relationships is characteristic of Pond’s writing and routinely arises in his work. Matt Pond speaks of nature as an extension of the human experience and the self/wilderness connection is a twenty-first century expansion on American transcendental ideals. Emerson’s theory, embedded in the natural world, was a response to his surroundings. Later through the twentieth and twenty-first centuries, the common denominator between Emerson and other American artists and thinkers is the land itself. Nature philosopher Aldo Leopold’s lyrical Sand County Almanac (1966) is not only a statement of theory, but also a work of prose, and his Land Ethic would be meaningless without its literary counterpart. His creative response to the land is what necessitates a moment of pause by the reader and allows for contemplation. Leopold writes, “That land is a community is the basic concept of ecology, but that land is to be loved and respected is an extension of ethics. That land yields a cultural harvest is a fact long known, but latterly often forgotten.” The cultural harvest can be reaped through diverse methods: physical experience, visual representation, transcribed descriptions like Leopold’s, and through song. What matters is that the land exists and permeates our thoughts. In this way, Pond responds to the pastoral landscape, but he does not neglect the sublime. To discuss an individual’s experience with nature necessitates not only an understanding of the pastoral, but of the sublime. A human being is outside the control of nature in the sublime. For the most part, Americans no longer engage with the wild on a daily basis like those who live in a less technological landscape, but the struggle for survival consumes our imagination. The sublime is a terrible experience, but also a fascinating one, pulling on an individual’s imagination while simultaneously requiring the employment of defense mechanisms. At least it is something, you know that you’re safe. Here Pond juxtaposes the uneasy feelings of a stagnant relationship with the possibility of danger in the ocean. The third and fourth lines provide double meaning. The ambivalence in which Pond approaches the water and relationship through the word “it” is countered by the repetition of the word “safe.” It is “safe as long as I see you out in the water.” Simply by a turn of the head the security of both the relationship and his watchful protection the individual in the water could vanish. Lifeguards are nowhere to be found, so it is his responsibility to stay alert. Pond speaks toward the relationship that exists with ennui and the apathetic energies that can become precarious. The multi-dimensional language Pond uses to describe his wish to be free is complicated with the desire to stay safe. The sublime in “It is Safe” is found in the feeling, like standing at the edge of a cliff, with one small move everything can fall apart. Hope is crushed by indifference and apathy is a reaction to fear of potential loss. Matt Pond is ideal for this analysis because he places at the forefront of his work language of nature, while not weighting his words with pretentious political or social messages. He may assert a different purpose for his work, but it is undeniably nature-speak. This creates a safe space for his listeners to enter in to an unaffected state of contemplation regarding their interaction with others and with the natural world. No, Pond is not a naturalist, or a woodsman, or a radical environmental political activist. Often these assumptions are made against those who speak through nature. To say this is exclusive to American culture teases with Exceptionalism, but in truth, it is the language of Americans. From the beginning, New World settlers were impacted by their surroundings and it was evident in their writing. This place created a sort of Arcadian fantasy and sublime dream in the minds of New World Europeans. This intellectual heritage continues whether we are aware of it or not. Historians, such as Leo Marx, attempted to explain the obsession with nature that for so long has been designated as “truly American,” but little effort has been made to show the theory in practice in the twenty-first century. Matt Pond portrays the picturesque garden and the sublime wilderness and thus creates a sincerely American body of work. Brady, Emily. The Sublime in Modern Philosophy: Aesthetics, Ethics, and Nature. New York: Cambridge University Press, 2013. Emerson, Ralph Waldo. “Nature,” Nature: Essays and Lectures, New York: Library of America 1983. Ingram, David. The Jukebox in the Garden: Ecocriticism and American Popular Music. New York: Rodopi, 2010. Leopold, Aldo. Sand County Almanac. New York: Ballantine Books, 1966. Pond, Matt. The Dark Leaves. Record. Performed by Matt Pond PA. 2010. Boulder, CO: Altitude Records. MP3. _________. Several Arrows Later. Record. Performed by Matt Pond PA. 2005. Boulder, CO: Altitude Records. MP3. David Ingram, The Jukebox in the Garden: Ecocriticism and American Popular Music (New York: Rodopi, 2010): 52, 55. MP to SRW, Written Interview, March 2014. “Specks.” Matt Pond. The Dark Leaves. Record. Performed by Matt Pond PA. (2010. Boulder, CO: Altitude Records.) MP3. Ralph Waldo Emerson, “Nature,” Nature: Essays and Lectures (New York: Library of America, 1983). Aldo Leopold, Sand County Almanac (New York: Ballantine Books, 1966): xix. “It is Safe.” Matt Pond. Several Arrows Later. Record. Performed by Matt Pond PA. (2005. Boulder, CO: Altitude Records) MP3.